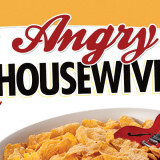 The Angry Housewives are baaaaaccckkk!! Bored with their everyday mediocre existence and tired of the men in their lives, our four heroines get angry and form a punk-rock band to win some much needed cash in a local contest. Beginning with the first licks, this satirical twist on 1980’s feminism turns into a feverishly-rompy punk-rock musical. Outrageous and irresistible, first produced in 1983 by the creative team of Seattleites Chad Henry and A.M. Collins, Angry Housewives lays claim to the longest sold out run of a musical in Seattle history. These gals will have you Eating Your $%# Cornflakes! These gals will have you Eating Your #$@^ Cornflakes!